Everyone wishes for a whiter, brighter smile. At Tilden Dental Group, we provide both in-office and at-home teeth whitening in Chicago. Our Streeterville dental practice offers Zoom!®, Opalescence Boost® and Opalescence Go® teeth whitening products for the highest quality treatment. 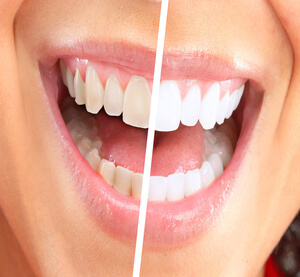 If you’re planning on revamping your smile with cosmetic restorations and want to begin with a uniform shade base, teeth whitening is for you. To achieve a whiter smile with teeth bleaching treatment, contact the practice of Dr. Jordan J. Tilden and Dr. Zachary Tilden today. There are many reasons why teeth whitening could benefit your smile. As time goes on, normal wear of the outer tooth layer (the enamel) leads to a dulled aesthetic. Consuming dark colored beverages such as coffee, tea, and red wine, or habits such as smoking, can result in yellow or brown teeth. With both in-office and at-home teeth whitening options, you have the ability to enhance the aesthetics of your smile. Boost® teeth whitening is an excellent option for patients who have busy schedules. At Tilden Dental Group, we offer in-office whitening treatment that can be completed within a single appointment. The whole process takes about 90 minutes with setup, but the actual whitening time is 60 minutes. First we polish your teeth, then place a gel-like gum barrier to protect your gums from the whitening agent. Cheek retractors are used to keep your lips off the teeth and then a desensitizer liquid is applied to your teeth. Now the whitening process can begin: The bleaching agent is applied on your teeth in 3 rounds for 20 minutes each. In between each round, the old whitener is suctioned off and a fresh coat is applied. This allows the Boost® gel to penetrate and break up stains and discoloration. Because no whitening lamp is needed, that means little to no sensitivity for you! As your teeth are treated, you are welcome to pass the time by listening to music. Boost® is ideal for patients who are looking to enhance their luminous smiles, especially before a major event. If you’re looking for a full whitening treatment, but can’t find the time to visit our dental practice, we provide take-home trays with Opalescence Go®. Patients don’t need to take bite impressions to use this kit; all trays and gel come pre-packaged. Patients receive 10 individual trays with each treatment kit, which lasts for six to eight months. This option is ideal for those who have completed in-office treatment and want to touch up their smiles’ brightness. Opalescence Go® is a convenient, expedited, over-the-counter whitening treatment that is recommended by our Chicago dentists. The whitening agent contains PF (potassium nitrate and fluoride) to help reduce sensitivity as well as strengthening enamel, improving your overall oral health. Contact Our Chicago Practice Today! Located in the Streeterville neighborhood, Dr. Jordan and Zachary Tilden provide cosmetic dental treatment with teeth whitening to restore radiance to the smile. For more information about our teeth whitening options, contact our dental practice today to schedule a consultation.